I was a guest on this week’s episode of This Week in Photo which included celebrity wedding photographer Robert Evans, stock photographer Nicole Young, and host Frederick Van Johnson. On this episode we discussed Google+ which is the latest social network offering from Google. I’ve been on Google+ for about a week and so far I’m enjoying it. It combines some of the best elements of Facebook with some of the features of Twitter in a clean interface to create a compelling service. 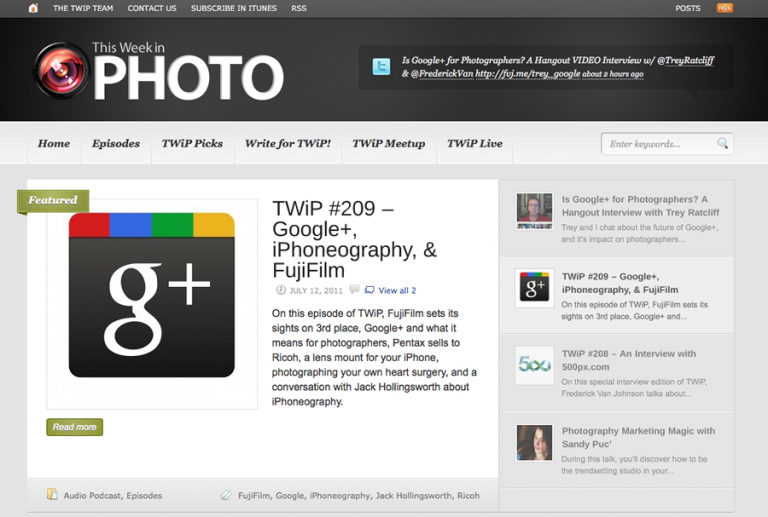 For photographers Google+ looks to be a great way to share your photography with others and to network with other photographers. One of the features of Google+ that I really like is that you can organize the people who follow you into ‘circles’. For example, I’ve created a circle of Edmonton Photographers, Edmonton Twitter users, friends, family, etc. Unlike Facebook, with Google+, when you share something, you can be selective in terms of deciding which ‘circles’ you’d like to share with. Let’s say you have some photographs from a family reunion that you’d like to just share with your family. On Facebook if you shared those photos, everyone you call your friend would see those photos. With Google+, you can choose to only share that content with people in your ‘family circle’ for example and then only they would see it. I think Google is onto something with their latest social offering. Facebook is a giant 300 lb gorilla that won’t be easy to move but so far Google seems to have caught people’s attention and they like what they are seeing. Time will tell if it’s going to be successful but based on my early days of using the service I think it’s the first real competitor to come along in awhile. Currently it’s aimed towards individuals but they have plans to expand the service so that businesses and brands can begin to use it to extend their social presence.Â They’ll also be rolling out new features and making improvements to the service over time so I will be eager to review it again in 6 – 8 months to see where things stand. Regardless of how you feel about social networking, I think it’s important for photographers to stay on top of these new technologies as they emerge and decide how they might want to integrate them into their businesses.